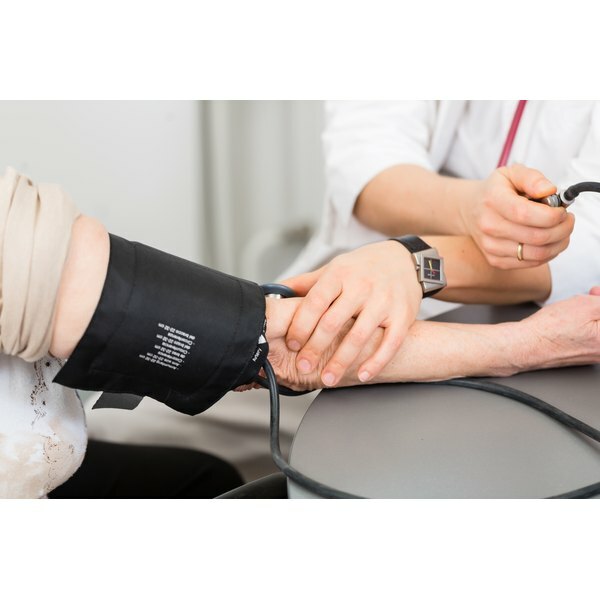 What Causes Hypotension With a Rapid Heart Rate? Hypotension is word that describes low blood pressure. In general, blood pressure reflects both the heart's ability to pump blood and the amount of fluid in the patient. A fast heart rate is the body's way of trying to distribute oxygen and nutrients at a faster pace. Low blood pressure and a fast heart rate together have a few different causes. Hypovolemic shock occurs when there is significant blood loss or low fluid volume in the body. The loss of fluid causes the blood pressure to drop. In response to the drop in blood pressure, the heart rate goes up in an effort to pump enough blood to the system. MedlinePlus states that losing one-fifth or more of the body's blood volume will cause hypovolemic shock. Septic shock occurs when a patient has an overwhelming systemic infection and the immune system goes into overdrive. The immune system, while fighting the infection, sets off an inflammatory response which causes the arteries to dilate. With the arteries completely dilated, there is not enough fluid in the body to fill this increased vascular space and the blood pressure drops. Again the heart responds by increasing its rate. MedlinePlus also notes that this immune response can create blood clots, which can block blood flow to vital organs. Cardiogenic shock is the result of a sick heart that cannot pump with sufficient force and thus is unable to deliver adequate blood to the body. An enlarged heart, defective valves, pulmonary emboli and pericarditis can cause cardiogenic shock. Cardiogenic shock, according to MedlinePlus, is also commonly caused by life-threatening heart rhythms such as ventricular tachycardia or ventricular fibrillation, which often follow a heart attack. When possible, the body tries to respond by increasing the heart rate in an effort to compensate.